OSWEGO, NY – While Oswego Hospital staff members hope to never execute the skills they learned during an emergency drill, they are prepared. Oswego Hospital recently held a mass casualty drill to evaluate the staff and facility’s response capabilities to a potential terrorist attack. Oswego Hospital recently held a mass casualty drill to evaluate the staff and facility’s response capabilities to a potential terrorist attack. Portraying the victims were Oswego BOCES New Vision students who self-reported to the hospital’s emergency room. 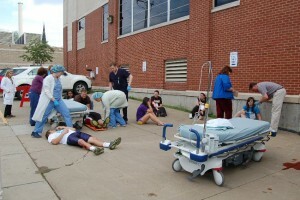 The students, along with hospital personnel, are pictured in one of the triage areas. The scenario for this fictitious event included numerous improvised explosive (IEDs) devices being detonated at a sporting event. Nearby, the pretend terrorists had also stationed several vehicle bombs, which exploded. These explosions resulted in many injures to participants and spectators. It is a known fact that when incidents like this occur, many of the injured often self-report to the nearest hospital emergency room. 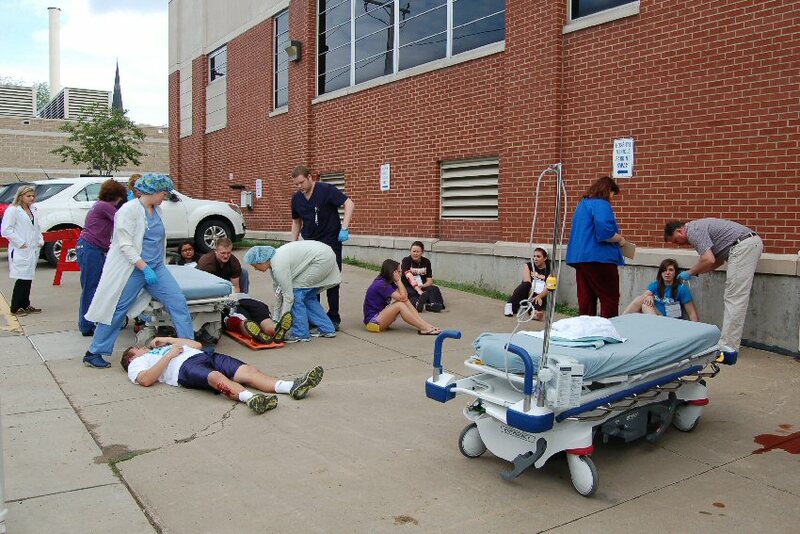 Portraying the 22 victims who suffered a wide range of injuries for this drill were Oswego BOCES New Vision students. Each of the victims arrived at the hospital’s emergency department on their own as part of the drill. When the injured students arrived, the hospital activated its command center, establishing a disaster triage site, as well as assessment/treatment areas by triage category. Staff determined and reported the disposition of each arriving patient and tracked them from arrival at the emergency department through their discharge. The drill was observed and evaluated by representatives from the New York State Department of Health, Oswego County Health Department and Oswego Hospital staff who are trained in exercise design. Making the student injuries more realistic for this drill were Ashley and Beverly Murtha, who are known for the makeup skills they use at local theatrical productions. As part of the exercise, the Oswego Hospital’s response to the incident will be examined and the evaluators will offer comments. An after-action report and improvement plan with recommendations will be prepared for use at future training exercises.